"The Presidents Race mascots William Howard Taft (right) and George Washington rehearse prior to game two of the National League Division Series between the Los Angeles Dodgers and the Washington Nationals at Nationals Park on October 8, 2016 in Washington, DC." It's a busy time of the year with a lot happening - yet always an exciting time as Major League Baseball post season has begun. While it tends to be a dry during this part of the season, weather still occurs and gets everyone soaking wet. Prior to game two of the National League Division Series between the Los Angeles Dodgers and the Washington Nationals at Nationals Park everyone was waiting around as the rain continued to fall. Heavy rain had been falling all day and there was that feeling that the game would be postponed. As any photographer should do during these situations, I made a couple laps around the field and in the tunnels to help illustrate the wait. 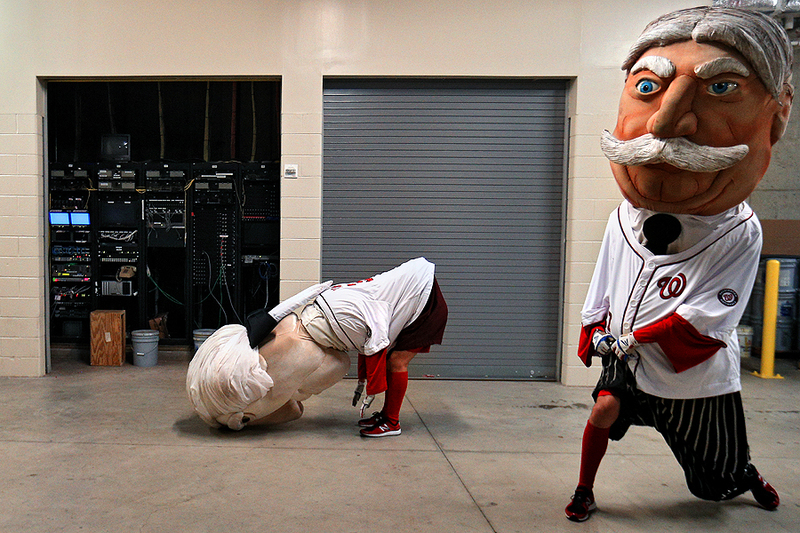 Along the way, I stumbled across The Presidents Race mascots as they rehearsed prior to the game. A funny candid moment that helped keep the afternoon relaxed before the game was eventually postponed.